More Americans are struggling to make ends meet these days. 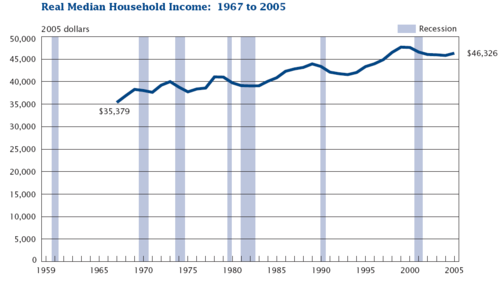 The chart below shows that consumer spending has been in a downtrend from 2007-2008. 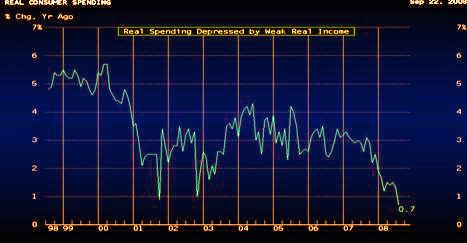 Slow growth in real wages and high levels of indebtedness have raised doubts about the ability of U.S. consumers to keep spending. Inflation is also eating into consumers’ spending power. The average inflation rate, as determined by the percentage annual change in the Consumer Price Index (below), shows that the rate of inflation is the highest it has been in the last decade. Great analysis on describing the consumer spending trend and how it will likely play out in the coming months. Retail spending has been slowing, and this has affected the expansion plans of retailers in a variety of areas. A significant factor eating into retail spending has been the rising cost of services. According to the Bureau of Economic Analysis, increases in bank charges, medical services, and education fees have caused a change in consumer spending of 1.6%, 0.9%, and 0.8% respectively. These factors make up a portion of the measure of consumer spending as indicated by Mark Mandel in his article on “The Mirage of Consumer Spending.” [http://www.businessweek.com/magazine/content/08_16/b4080000602263.htm]. To offset these additional costs, consumers are forced to cut expenditures in other areas such as vehicles, computers, clothing, etc. A stable economy as well as an increase in worker wages and/or a decrease in service costs will be necessary to help boost consumer spending in the retail sector. It is a difficult problem to address, but steps are being taken to help stabilize the economy, which will be a key factor in restoring consumer confidence. The U.S. has lost jobs every month this year, and the unemployment rate in August jumped to a five-year high of 6.1 percent, according to Labor Department data. At the same time, eight consecutive months of job losses in the economy and declines in home prices are making shoppers wary. One is that consumers often make large purchases on credit. As credit tightens, many will simply be unable to purchase the big ticketed items, for lack of access to favorable loans. On the flip side, if the credit crisis turns into a general recession, people will simply start consume less and save more to bring down their discretionary spending, much as they’ve curtailed driving in response to high gas prices. Last week’s financial crisis could put more pressure on luxury-goods sales, as the financial sector employs a big base of affluent customers, analysts say. Retailers are prepared for bad news, having spent a year coping with sluggish sales by tightening inventories and deploying job-scheduling software. Fourth-quarter hiring expectations in wholesale and retail businesses are at a 17-year low, according to a survey of 14,000 employers released earlier this month from staffing firm Manpower Inc. According to Wendy Liebmann, chief executive officer of research and consulting firm WSL Strategic Retail, New York, the economic climate will force more high-end retailers, in particular, to run sales promotions earlier this year.